Comment: Experim3ntus had released three Eps before he changed his nom de plume to another one, Vuohe. Under the new name, though, he was just revamping old compositions. 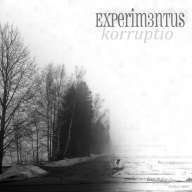 The Finnish producer`s 5-track issue Korruptio is remarkable due to unifying the visual side of the cover print wherein one can feel sensations of late autumnal uneasiness due to representation of higher concentration of fog and clamminess than usual annually. Musically the listener can perceive vivid drifts between majestic ambient panoramas and eerie darkwave sweeping being immersed in heavy pessimism and impending tough and morbid times. That’s chilling. At times those suggestively epic templates are slightly “corroded” by samples, “accidental” noises, glitches, and other treated sounds. By the way, it is an especially right moment to listen to in the early morning when the Sun is still being eclipsed and greyish darkness and tangible humidity are in full sway. It must be said surprisingly I had to close the window of my small living room because all those outer noises merged seamlessly into the soundscapes. Maybe sometime in the future I will review it in the described manner. It might be a composition called Ajan rakenne on MUUTTUNUT (in fact, the title of the track is even longer) carves out from the rest because of coming very close to the classic tradition of Kosmische Musik though excelling at Tangerine Dream-alike templates in the first half only. The latter part of it will slowly be changing into a dormant yet rocky glitched-out soup. This is an astonishing bunch of elaborately accentuated compositions. Get it and additionally I recommend listen to his other issues (Experim3ntus EP, and Autius EP) and Vuohe`s Yksinäiset Vuohet, and Bleat Runner (which involves a new version of Ajan rakenne on MUUTTUNUT) either. The issue is a part of the short discography of Gabumat Records, which involves the Finnish music only.